1929 marked a turning point for Woolworth's. For fifty years it had followed the Founder's guidance, relying on word-of-mouth and spectacular window displays to market its offer. It celebrated its half-century in the Main Streets of North America with its first sustained campaign of advertising. This highlighted the ultra-low price of the stores' most popular lines as the 'originator of the 5 & 10¢ store'. Two booklets accompanied the salvo. One recounted the story, adding a modern twist to the pattern that Frank Woolworth had employed for the fortieth anniversary in 1919. The other created history of its own, comprising a pocket-guide to the full product range for customers to refer to at home when planning their purchases. This addressed challenging market conditions. It had long contended with rival 5 & 10¢s, but they had begun to present a real threat after adding higher-priced lines. Woolworth had long postponed such a move, despite the impact of price inflation on its range. The campaign proved a great stopgap answer. Shopper numbers rose rapidly, boosting sales. The results inspired the Directors in London to book full pages in the national press to mark the chain's stock market listing. Each ad showed up to fifty great value lines, the menu from the Woolworth's café, and boasted that it operated over 400 branches across Britain and Ireland. 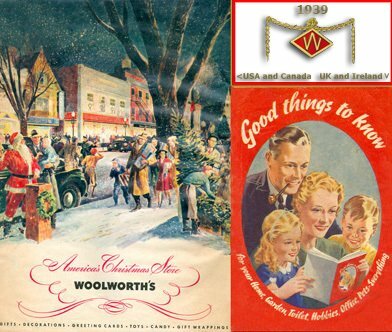 During the Thirties catalogues became established, and as the years passed publication heralded the arrival of the Christmas season, when the stores would be crammed with wonders from around the globe. This page takes a whistestop tour of the catalogues, using them to explore how people shopped in bygone days and revealing some of the crazes that made each Christmas special. In the early 1900s only upmarket department stores and mail order companies published catalogues. Then in 1929 F.W. 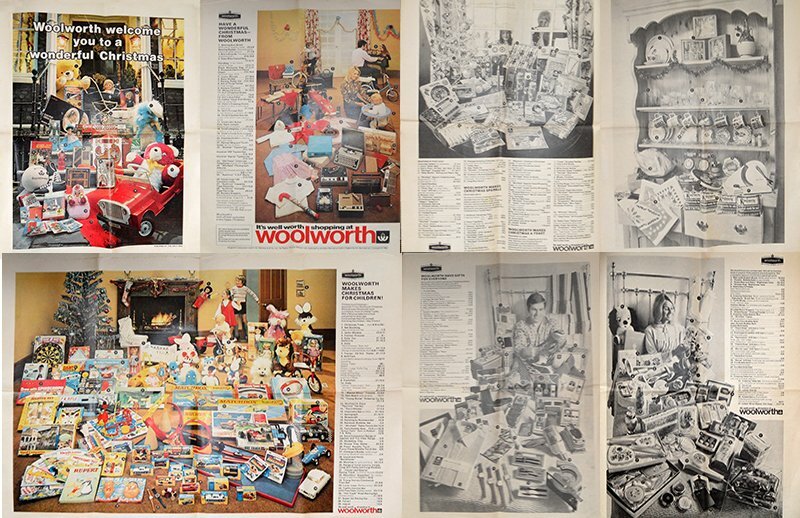 Woolworth Co. broke the mould as part of its fiftieth anniversary celebrations. It printed a million copies of a Home Shopping Guide and gave these away to customers across North America. The simple booklet proved so popular that many people kept them for posterity. Rather than listing every line, it showed the types of things that were sold in each department in both words and stylish modern-art illustrations. From the earliest days, when Earl Perry Charlton and Fred Kirby had taken the brand to the west of the Rocky Mountains, the far-flung stores had recouped the increased cost of shipping by raising the upper price to 15¢. So two versions were produced, emblazoned with "Nothing over 10¢" or "Nothing over 15¢" on the covers.reflecting the fact that the chain had traditionally recouped the increased cost of shipping west of the Rocky Mountains with a higher fifteen cent price limit. In the months after publication many Store Managers were surprised by the number of people who carried the booklets and asked to be directed to the lines that they and their partners had selected at home. View more pages from the Home Shopping Guide. In 1931 shares in the British Woolworth subsidiary were listed on the London Stock Exchange. The company went on to dabble with press advertisements for its best-selling products, pitched to coincide with major store openings. 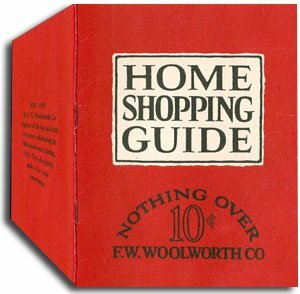 In 1938 the stores began to offer a booklet called Good Things To Know at threepence (1¼p) a copy. The early 'advertorials' carried a mix of articles and supplier advertising, and featured the stores' best-sellers and how to use them. Millions were sold. Plans for a second Good Things to Know were reworked after Britain declared war on Germany in 1939. Its simple no frills layout was the polar opposite of a new initiative in the USA. America had entered a period of prosperity after the hardship of the Great Depression. Incomes were rising giving people more to spend. Woolworth resolved to capitalize on this by showcasing its new lines. Over a five year period the 5 & 10¢ had morphed into a variety store with a much wider range after abandonning its price limit. Working in great secrecy, Excecutives prepared a full colour Christmas Catalogue, which was unveiled in November 1939. The competition was stunned. The publication proved to be a game-changer. The layout was modern and optimistic. It conjured an image of a traditional, peaceful family Christmas. London's Good Things to Know was much more sober. Its red covers wrapped around plain black and white pages, printed on low-grade paper. Articles on military insignia and how to spot enemy planes were illustrated with line-drawings, and nestled alongside instructions of how to black out a window and prepare for an air raid. 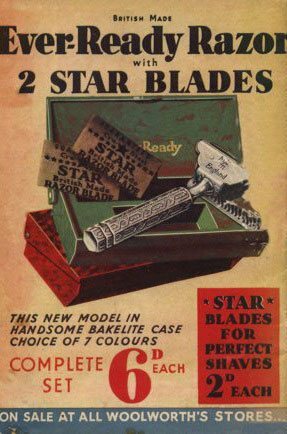 It promoted the products available to repair shoes, clothes and furniture, which were all in short supply, explaining how to 'make-do and mend'. Buried deep inside was a small announcement that Woolworth had reluctantly dropped its sixpenny price ceiling in order to obtain stock. 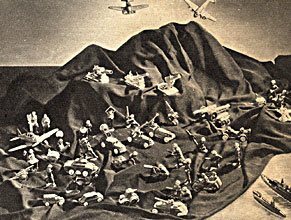 Despite strong anti-war sentiment in the USA, news of "the European War" stimulated a craze for military toys. With hindsight it is hard to miss the irony of Woolworth's response. Its catalogue included a double-page spread photograph of its khaki-painted lead soldiers, sailors and airmen looking out over a sea of rubber boats and submarines harboured in a US base. Some of the items had been made in Japan. It would be more than thirty years before another catalogue appeared in the UK. 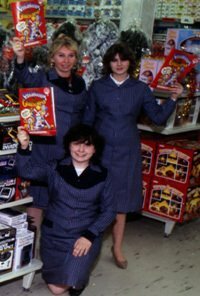 The emergency kept the stores bustling, allowing the limited stocks of paper to be used to publish morale-boosing Mighty Midget comic books. These proved highly effective at distracting children who were forced to endure scary nights in air raid shelters as bombs rained down overhead during the Blitz. After the War the British stores enjoyed such a dominant market position that a catalogue was considered superfluous. Woolworth faced a much stiffer challenge in the USA in the 1950s. The stores faced intense competition from S.S. Kresge, J.J. Newberry, W.T. Grant and Kress. Executives used catalogues and advertising to fight back, showing great skill and creativity to engage a new generation of shoppers by targeting children and cost-conscious young families. One key tactic would be controversial today. Catalogues were dressed as comics and were given away to children. Executives shamelessly generated 'pester-power' by placing bold advertisements on alternate pages alongside the comic strips, encouraging kids to drag their parents to the stores for toys and games, knowing that once they set foot inside the adults would be drawn to splash out on the array of homewares and fancy electricals that adorned their displays. There were catalogues for homemakers too, backed by full-page colour advertisements in style magazines. Rather than rely on third-parties the chain handled photography and copywriting in-house. The creative team won plaudits for a campaign which introduced 'Susan Smart'. The sassy lassie furnished her modern, fashionable home from the shelves of Woolworth's. The unfolding story showed families on tight budgets how to add stylish touches and creature comforts without breaking the bank. After immense success in the 1950s, British sales growth started to slip back as the competition witnessed in the USA crossed the Atlantic. New rivals with lower overheads and up-to-date working practices like self-service presented a tough challenge. The decline opened the door for more American intervention. The parent had been prepared to sit back and reap the rewards while profit was rising, but things had changed. Initially it encouraged an army of Consultants to share what they had learnt in the USA, for London to use or lose. But when the soft touch met resistance, it took a stronger line. New York insisted that the UK adopt its new out-of-town 'Woolco' formula, and replace its many established house brands with a single own label, which took shape as 'Winfield'. The parent insisted on increased expenditure on marketing, demanding press advertising and a new catalogue. In response a new Sales Promotion and Advertising portfolio was established at the London HQ in Marylebone Road. Its first steps were quite tentative. The team booked advertorial supplements in local papers to mark the opening or extension of large flagship stores. They then began to experiment with double-page spread advertisements in all of the major daily newspapers, featuring the latest sales promotions and bargains. Behind the scenes they tried to determine which titles had achieved the best results. In 1970 they chose The Daily Mail to publish the chain's first modern Christmas Catalogue. The finished publication consisted of eight pages, printed on two folded leaves at the centre of the popular tabloid newspaper. In an attempt to get the best value for money two sides were printed in colour, with the remainder in black and white. It employed lifestyle photography, showing a young family in a mews-style suburban house, crammed with goodies from the High Street store. Around half the products were toys and games, but food, toiletries, electricals and fancy goods all featured, with mum and dad each getting a page of their own. Dad was shown playing one of the latest 'fancy' items, an electronic organ, while the family would have the choice of two portable Imperial Typewriters, which were considered the height of fashion at the time, and an essential for any up-and-coming family who were keen to impress their friends. Public reaction was good, though the parent company in New York rated the publication 'one small step' when (in the language of the day) 'one giant leap' was needed. Their main criticism was that it was pitched too far up-market, missing many loyal shoppers who preferred red-top papers. Despite this they rated it a good platform to build on. The following year, rather than switch to a red-top tabloid, Woolworth targeted the UK's best-selling magazine, the Radio Times . 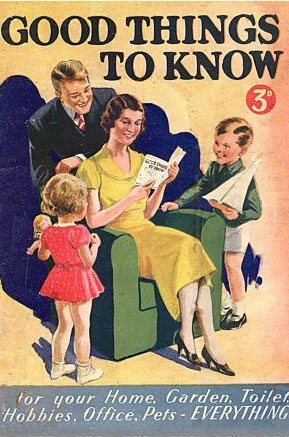 The TV listing publication had become a popular favourite, and was to be found on the coffee tables of the majority of homes across the UK. At the time its only major competitor was the rival TV Times, produced jointly by the local broadcasters on the ITV network. Rules prevented either broadcaster from listing the other's programmes. 'RT' had established itself as the market leader because the BBC offered two television and up to six radio channels, while ITV had just one very popular television station offering a mix of national and local programming. Woolworth's research indicated that the only way to reach the great majority of households was to advertise in both journals. The 1971 and 1972 Catalogues sent shockwaves around the retail industry. The approach had not been tried before and Woolworth's innovation presented a real threat. As the decade continued an increasing number of retailers competed for pride of place in the optimum week, pushing the cost of the space upwards. Ultimately basic economics persuaded Woolworth's Board that it would be better to door-drop a catalogue in the major conurbations to complement a drive to distribute them in-store. 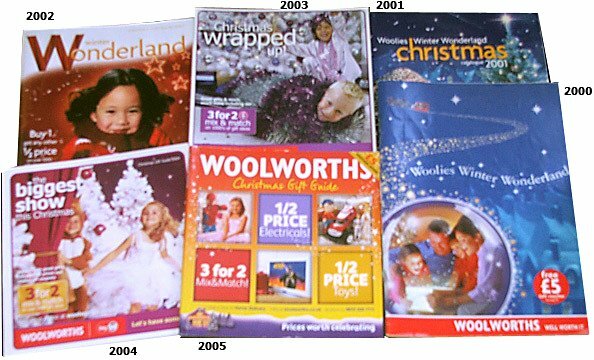 The content of the catalogues reveals how far Woolworth had moved up-market since its heyday as the Threepenny and Sixpenny Stores. The products featured included luxuries like electric organs with prices of up to fifty pounds, the equivalent of over £200 or $250 today. The Company chose to use the publication to showcase all that was new, majoring on Records and Tapes, its 'luxury' fashions and a wealth of time-saving gadgets for the home, ignoring the thousands of bread and butter lines that it sold daily for under a pound. The push for larger, higher priced products was accelerated when the Board launched a new chain of catalogue stores under the new trading name of Shoppers World . 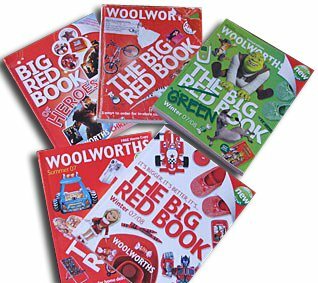 While born out of Woolworth, and sharing the same buyers, these stores produced a big book catalogue, traded from separate premises (or occasionally shops-within-shops) and went head-to-head with traditional Woolies outlets. The initial idea had come from Canada. The two subsidiaries soon agreed to pool resources, despite choosing different names for their ventures. The Canadians chose to call their outlets Woolco Catalog Stores , capitalising on the local success of the rapidly-expanding out-of-town brand of the same name. The newly-born Shoppers World faced tough competition. Its launch prompted Richard Tompkins of the trading stamp giant Green Shield Stamps to speed up a repositioning that had planned. The entrepreneur had begun to accept cash payment to allow shoppers to top up the stamps they had collected, and had rebranded the chain Argos in July 1973, opening his first purpose-built store later the same year, as preparation work for Shoppers World and Woolco Catalog Stores continued in secret. 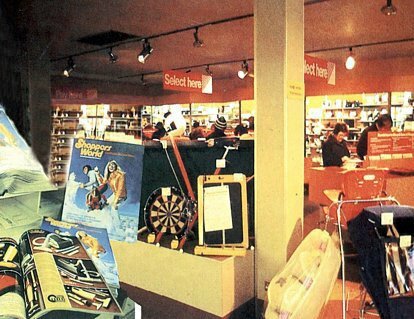 Shoppers World's first stores opened in Autumn 1974, with outlets in Heywood, Leigh and Nelson in Lancashire, Edgeley, Stockport and Knutsford in Cheshire, Stourbridge and Birmingham in the West Midlands, and in the City of Liverpool. Behind the scenes the Woolworth Board had invested heavily to establish a robust infrastructure that would sustain a mass roll out. This comprised a headquarters and warehouse in Heywood, a short distance from the High Street stores' central accounting office in Castleton, a photographic studio and a team of copywriters, allowing the catalogues to be produced in-house, and a new team of dedicated Buyers. The big book directory was printed in full colour. It featured a broad range of items, most of which were drawn from Woolworth and Woolco. Most were offered at significantly lower prices. The turnover of these pilot stores was boosted by advertising a 'Woolworth by Post' service in the National Press and the ever-popular Radio Times. The Heywood team processed the orders and fulfilled them from their warehouse. By 1975 the British Woolworths had no less than three catalogues. One promoted the Christmas range in the High Street, another the full Shoppers World merchandise mix, and the third offering just a small selection for mail-order. 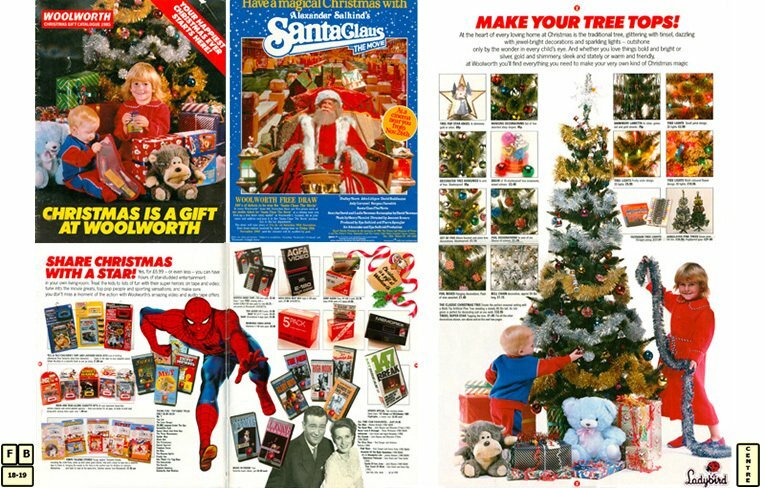 By 1982 the Christmas Catalogue had grown to forty full colour pages in A4 format and was home delivered in the major conurbations, and was also available to collect in-store. The layout was loud and down-market. It featured the best-selling budget lines, but majored on a hundred products that were priced at fifty pounds or more. The best sellers were a TS33 Tower Hi-Fi system from Alan Sugar's Amstrad (£159.95) and a Ferguson 3790 Moviestar 14" (30cm) colour TV (£189.95). Days after its 1982 catalogue went to press, Woolworth UK was sold in a management buy-in. A big shake up followed. Old stocks and items in the pipeline were cleared, and many of the largest freehold stores were sold. The 1983 Catalogue was the largest and loudest ever. Boasting an 'ever-more spectacular Christmas', it had sinister cartoon clowns on the cover, and was laden with an eclectic mix to suit all tastes and budgets. For the tenth year, electric organs featured strongly, vying for attention with simulated mink jackets (£24.95) and men's Burlington shirts (£5.99). Computers provided a touch of the exotic, in the form of Commodore Vic 20 Starter sets (£139.99) and Sir Clive Sinclair's popular ZX Spectrum (£99.95). By 1985 the brand had moved in a new direction. Many of the old ranges had been dropped. Adult Fashion, Food, Hi Fi, Television and Computers were no longer stocked. Instead the stores concentrated on six key ranges, Gifts and Sweets, Entertainment, Looks, Home and Garden, Cards and Stationery and Kids Toys and Clothing. 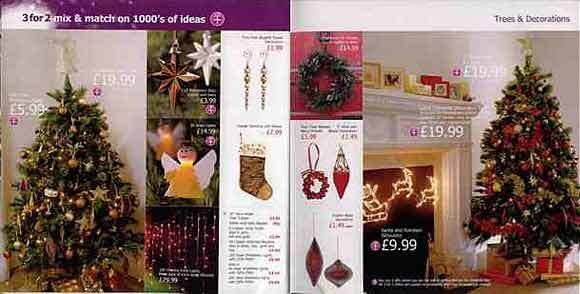 The changes were reflected in a new style of catalogue which had an up-market feel. The layout incorporated more white space and a crisper design. It showcased the chain's new, exclusive licence of Ladybird Clothing. The signature Ladybird Dressing Gown featured prominently on the cover and was given an elegant double-page centre spread. The new formula balanced up-market ranges with a strong value message. 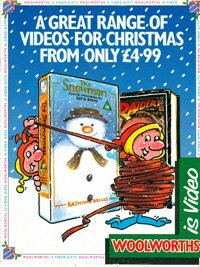 Price competiveness was reinforced by a coup in which the stores became the first to offer Budget Videos from £4.99. The range was launched under the slogan 'a video for the price of a blank tape'. One of the best performing ranges under the new look was Entertainment, as the stores became market leaders in chart music as well as videos. They sold one in three compilation albums and more singles than anyone else, thanks to clever marketing. The firm sponsored Smash Hits , which it gave away in-store, and later produced its own Tracks Magazine. As the Nineties dawned, one of four pounds taken through the tills in the British stores came from Entertainment lines. Videos alone generated over £200m turnover annually, earning the range a dedicated 24 page catalogue, which was funded by the major labels. By 1991 a regular pattern had been established, featuring seasonal lines, supplier promotions and coupons. Early-bird discounts encouraged shoppers to bring forward their purchases, reducing the pressure in December. The innovation was widely copied in the High Street. After almost a decade of strong sales and profit, in 1993 and 1994 performance started to slip. This led to a boardroom shake-up and a re-evaluation of the trading formula. The soul-searching prompted initiatives to improve value in-store. Some prices were reduced and the merchandise mix was adjusted to redress a perception that the chain had moved too far up-market. The thinking was carried through to the pages of the catalogue. The 1994 and 1995 editions were distinctly different. In the first, copywriters focused on style, seemingly deeming prices too vulgar to menton. The popular Chad Valley, Colourplay and Ladybird own-brands were scarcely mentioned. Instead the pages brimmed with the more expensive brands from Hasbro, Crayola and Forever Friends. A feature entitled "How to dress your tree" added a touch of class, but ate into the space traditionally used to maximise sales. By the following year the tide had turned. A new marketing effort promoted the chain's price competiveness. It showed the value ranges and highlighted many items which had been reduced in price. 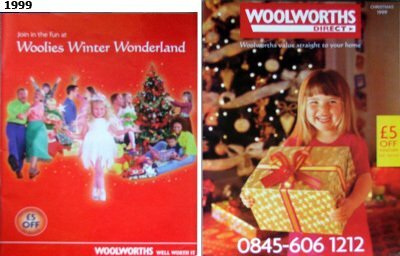 The campaign also drew on customers' strong emotional attachment to the brand, introducing the catchy new slogan 'Woolies Winter Wonderland'. By 1997 almost half of the products in the catalogue were exclusives and own-labels. The text included strong price statements like '£5 cheaper than last year' and 'Trees and Lights - our promise to you'. New coined words like 'Supervalue' also featured strongly. The measures boosted the year's profit to £51.1m in 1994/5. It rose to £84m in 1996/7, peaking at £107.6m in 1997/8. In 1998 a new buzzword floated across the Marylebone Road. Kingfisher embraced "Alternative Channels", which it rebadged "Complementary Channels" to bring its 'OpCos' on-side. Woolworth embraced "Complementarity" in its usual way - going forwards by looking backwards. Mail order was "re-introduced" after a twenty year absence. The West Country blazed the trail, inviting shoppers to order any item from the Christmas Catalogue for home delivery. Within weeks sales broke the £1m mark, proving the demand. The following Spring a small catalogue was distributed nationally promoting the Easter offer, and was followed by similar publications for Summer and Back to School. Rapid sales growth paved the way for a much larger Christmas issue. The 132 page heavyweight promised that 'Wonderland' would be 'delivered to your door'. It carried many of the chain's largest items, supplemented by an exclusive selection of larger toys, bikes, hi-fis and televisions. Orders could be placed by post or over the telephone. The bold and confident public persona hid controversy behind the scenes, as the Direct team tried to get established. City Analysts smelt a rat, asking why the Company had not embraced the Internet, and why the stores had two competing catalogues, one for ordering and a similar one without that feature. Kingfisher was unabashed, hoping the 'friendly rivalry' would be good for sales. It ploughed ahead with additional investment to extend the offer. Under its guidance Woolworths sought a specialist outsource partner and chose the leading cataloguer, Freemans plc. It helped to set up a new fulfilment centre in Braunstone, Leicester, provided marketing expertise to enhance the catalogue and granted the Buying Team access to its analytical, fulfilment and marketing systems. For a second year two catalogues were distributed in-store. 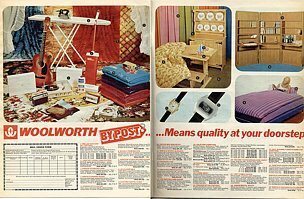 In the countdown to the millennium, the launch of woolworths.co.uk was eclipsed by a salutary lesson in the challenges of traditional mail order. Orders far exceeded expectations, leading to a shortage of stock and a backlog of postal orders which had been paid by cheque and could not be fulfilled. The Company was berated live on television by the BBC's influential Watchdog programme, forcing urgent remedial action. Changes were made to the offer in 2000. The Store and Direct catalogues were merged to cut costs and eliminate customer confusion. A small teaser catalogue was mailed to subscribers, inviting them to collect the full version in-store or shop on-line. Payment processing was refined. After soul-searching focus groups persuaded Executives to continue accepting payment by cheque. They were relieved when the early sales data from the new catalogue showed that over 60% of the people who had been disappointed the previous year had taken up the offer of a discount on another purchase; one-third shopped on line, with the remainder again buying by cheque. Behind the scenes the failure of a planned 'merger of value champions' between the Kingfisher parent and the Asda supermarket chain prompted a radical re-think. Ultimately Kingfisher withdrew from the High Street. Superdrug was sold privately. The remaining companies were hived off into a new business comprising Woolworths, MVC, Entertainment UK, Streets On Line and VCI Group. The enterprise was baptized 'Woolworths Group plc'. Its stock was listed on the London Exchange at the beginning of August 2001. Kingfisher's last acts were to saddle the business with debt, and place the controversial former Railtrack Supremo Gerald Corbett at the helm as Chairman. It was announced that he would consider both internal and external candidates and apppoint a CEO in due course, but would be 'hands-on' to begin with. One of the new Chairman's first acts was to axe Multi-Channel Retailing completely. Corbett did not embrace the Internet and saw no future in customers ordering goods for home delivery. The relationship with Freemans was terminated, the fulfilment and call centres were closed and 200 staff were laid off. Initially he intended a complete shutdown, until Executives pointed out that the market-leading web publisher Streets on Line was one his operating companies, and publishing websites was all they did. Kingfisher had paid top dollar to acquire 'the very best' at the height of the dotcom boom. Corbett reluctantly agreed to Streets developing an entertainment-only offer for Woolworths, alongside a matching offer for its sister company MVC, a specialist retailer which had formerly been known as the Music and Video Club. The Annual Accounts at the end of the first financial year with Corbett at the helm included a staggering £10 million charge to write off all of the investments that the operating companies had made in new channels during the Kingfisher years. 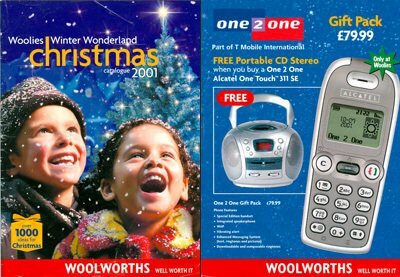 Corbett's acts of corporate vandalism forced big changes to the 2001 Christmas Catalogue, which reverted to its mid-nineties styling as a sales aid. After feedback the Chairman made a slight concession, authorising a helpline to help customers to locate hard-to-find items in nearby stores. 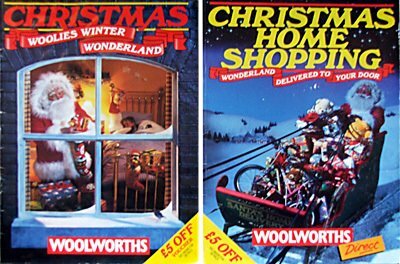 City analysts were underwhelmed, challenging the strapline 'everything you want and all you need for a magical Christmas with Woolworths'. When he heard this criticism, Corbett is said to have cursed "well that's all I need"! 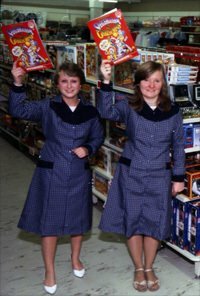 The appointment of a new CEO, Trevor Bish-Jones, in 2002 heralded a new strategy, which he called 'Kids and Celebrations', which geared the offer to a new target customer called Debbie. The catalogue was restyled in a compact handbag size. Its content was more aspirational, reflecting Debbie and her family's deeper pockets. While she was said to be careful with money, her kids wanted for nothing, especially at Christmas. The pages featured designer kidswear for parties, up-market toys and stylish accessories for Debbie's home and kitchen. Shoppers blind-testing the catalogue might have been forgiven for believing it was from Selfridges or John Lewis. It featured keenly priced, well designed ranges that were a far cry from the traditional value selection, and would be beyond the budget of some customers. As a comparative newcomer Bish-Jones appeared unaware that his other big, new idea was neither big nor new. The grandiose name, 'elastic walls', was little more than a repackaging of the Kingfisher's strategy from 1998, which Corbett had dismissed and written off. The plan would give shoppers at the smaller stores access to the full range from the largest branches, via touch screen kiosks or at the tills in-store, over the web or by phone from the catalogue. Somehow the CEO's patois made "elastic walls" more appealing to self-styled retail gurus and investment analysts than Geoff Mulcahy's "complementary channels" had been during the dotcom boom. To achieve the vision Bish-Jones would have a lot of catching up to do, as he restored what his Chairman had thrown away. The new catalogues received a good press, with the in-store ordering system winning a coveted award as the world's best customer-facing solution in Chicago in 2006. Sales built progressively to £80m a year. But the success was only skin-deep. Orders that shipped directly from the supplier, including Music and Video from the Group's own Entertainment UK, were generally profitable, but the firm lost an average of £5 on every other order. Bish-Jones persevered with the strategy until 2008. Soon after the CEO was ousted, the Board announced that the Autumn 2008 Big Red Book would be their last. Days after the final catalogue hit the shelves the firm collapsed into Administration. By October 2008 the fulfilment operation had been suspended and the store chain had stopped taking orders on-line. It could be argued that the Big Red Book and the work on Multi-Channel Retailing lay behind Shop Direct's decision to acquire the brand and take it on-line. As one of the market leaders the new owners were able to boast a strong track record of establishing profitable mail-order services on the Internet. Such success has been achieved by facing up to tough choices, like retiring the Woolworths name in order to concentrate their energy and skill on their world-class very.co.uk site. 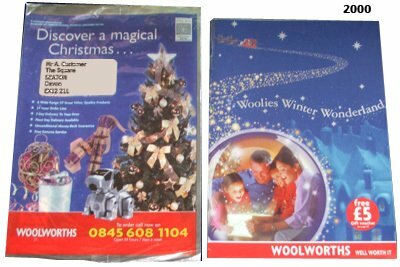 Today shoppers will have to go to Germany, Mexico or the Caribbean to pick up a Woolworths Catalogue, or visit www.woolworth.de to see the latest ranges.